“On a hill above the valley there was a wood. In the wood there was a huge tree. Under the tree there was a hole. In the hole lived Mr Fox and Mrs Fox and their four small Foxes.” - Roald Dahl, Fantastic Mr Fox Mr Fox is clever, far too clever for his local farmers, Boggis, Bunce and Bean. Still, even a very clever and cunning fox sometimes gets caught out. When those devious farmers finally locate the whereabouts of Mr Fox's home, it puts him and his family in danger. But Mr Fox is never beaten. By trapping him and his family inside their foxhole, it looks like Boggis, Bunce and Bean might have accidentally shot themselves in the foot instead. 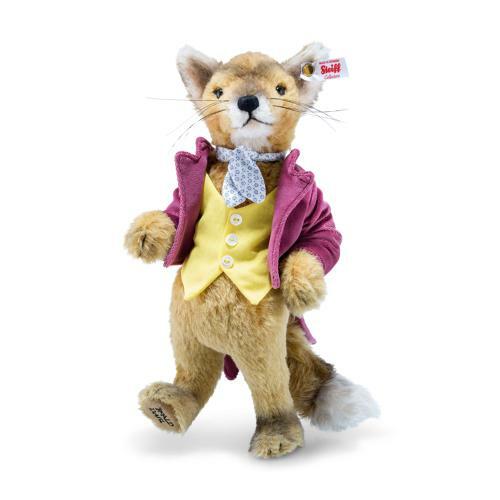 Inspired by Quentin Blake’s original illustrations, Steiff bring their quintessential style to the beloved Roald Dahl classic Fantastic Mr Fox with their fantastic interpretation of Mr Fox. “Nobody in the world can dig as quick as a fox!” Mr Fox.